Zoe is thirty, working at as a janitor at Pope Pharmaceuticals when the jar shows up in her house. Her alarm system didn’t register an intruder, and there’s nothing to indicate where the jar came from, or why it is there. To deal with the strange appearance, Zoe enlists the help of friends who work at the museum to try to figure out what exactly the jar is, but she also heads to a therapist, with an alleged dream about a jar. Before long, though, the cats in Zoe’s building all begin to disappear, and people around her start getting sick, first those who examined the jar, then her neighbors. Throughout the city and the world, people begin to die from this bizarre disease, and those who don’t die mutate in bizarre ways. Before long, society is breaking down and the President of the United States has declared that humans are no longer a viable species. White Horse alternates between the story of the rise of the plague – nicknamed White Horse by a televangelist, after one of the horses of the apocalypse – and Zoe’s present, as she works her way through Europe. During the lead-up to the utter collapse of civilization, Zoe and her therapist, Nick, formed a romantic relationship. She knows that he planned to try to find his parents in Greece, and as the world continues to fall apart she realizes how much she needs to be with him and travels across a dangerous landscape, full of mutants and others who have lost their humanity in an even more terrifying manner, in order to find him once again. Zoe is a badass main character. As she struggles to keep even herself alive as she crosses a continent, she is unable to leave others who are suffering, which leads her to travel with a blind young woman who was being raped by her father and uncle. Sight is a fairly important sense at the end of the world, so it is possible that by bringing this girl along Zoe is endangering herself and her own mission, but she is unable to let the injustice of the situation stand, and rescues and protects the girl at great cost to herself. She fights when it is necessary to protect herself and the innocent, but at the same time she keeps her humanity in an increasingly inhumane world. She is, above all other things, a survivor, both physically and mentally. In White Horse, Adams has created a fascinating apocalyptic world. By alternating between the world before and after the complete downfall of society, Adams keeps the story moving forward quickly, she gives enough time in each world that the reader is not left frustrated by lack of information, but also moves on quickly enough to keep up a good deal of suspense. The result is a page-turner of a book, with enough depth and world building to leave the reader feeling satisfied when the book is over. 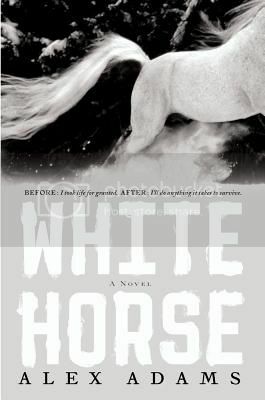 White Horse is apparently the first book in a trilogy, and there is certainly enough material there to continue to build on this world, but Adams also brings her story to a satisfying conclusion – no cliffhangers here. All in all, White Horse is a haunting and engrossing story of survival. Highly recommended.